Check it out! 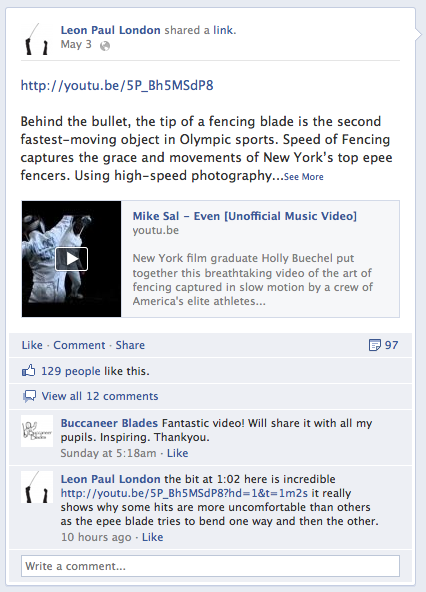 Leon Paul posted a nice comment and shared my cousin’s link of Speed of Fencing on their Facebook page! Combine our two YouTube pages and the Vimeo page, there are OVER 30,000 VIEWS!!! Not too shabby 😉 Click on the image and “like” Leon Paul’s page. Also related to Leon Paul, I will be releasing the behind-the-scenes video to the WORLD CHAMPIONSHIP US Men’s Epee Team photo shoot. Here’s a sneak peak of Ben Bratton in action at the shoot. Thanks to Michael Dote for getting me involved in the Leon Paul shoot!